Once again I have received a newly released ROCCAT gaming headset to take for a spin. In this review I describe my findings and personal preferences, while trying to be as informative as possible. Hopefully I can provide you with enough information for you to decide if the ROCCAT Khan AIMO RGB gaming headset is worth your hard earned money. If I missed something, or if you have further questions, please let me know in the comments! The review chapters have headlines, so you can decide if you want to read everything from the beginning, or skip to the part of the review that is of most interest to you. The ROCCAT Khan AIMO box is sturdy, informative and stylish like we are used to see from ROCCAT. On this headset box there is no fancy front flip and transparent window, which makes me feel like ROCCAT focused on spending time and money on what is inside, rather than the box itself. This is a good thing. I get 7.1 surround without a ton of 3.5mm jack plugs, and the analogue noise, with just a single USB plug instead. ROCCAT has optimized the Khan AIMO for weight and comfort, which is always nice. Since it is optimized for noise cancellation, I should be able to focus on my game, while everyone in-game can hear me loud and clear through the “real-voice” mic. I personally don’t care much for the LED lights, but the ability to tweak colors to fit your preference is a good addition to earlier ROCCAT headsets with just a single color LED and no OFF-switch. Inside the box we find only what is absolutely necessary, which once again makes me applaud ROCCAT for focusing on the actual headset rather than unnecessary accessories. When I buy a headset, I don’t want to pay for a goodie-bag of stuff, but just a nice headset. 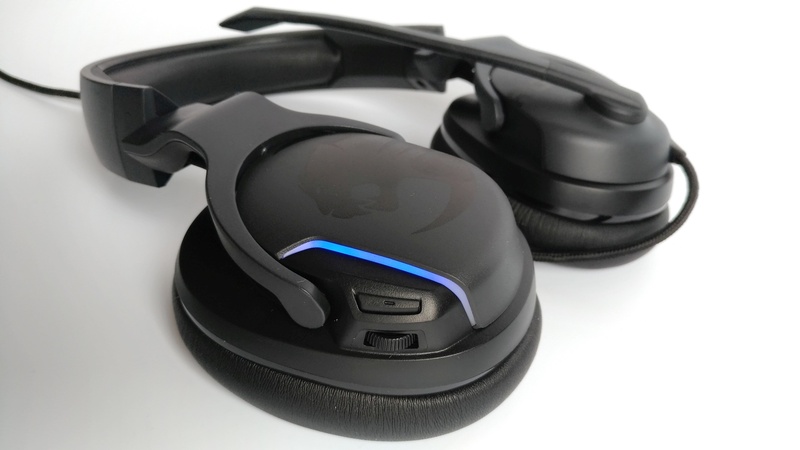 The earcups of the ROCCAT Khan AIMO headset will turn a full 90 degrees to allow easy transportation. The microphone is not detachable, and can rotate up to 120 degrees from vertical down to near your mouth. 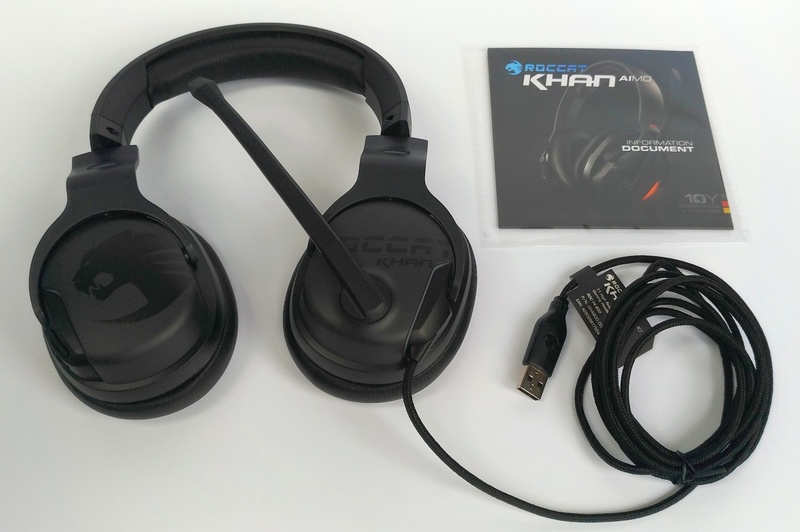 First impression of the ROCCAT Khan AIMO headset is that it is well-build and sturdy, designed to withstand significant use and a bit of transportation punishment. Most parts are still plastic rather than metal, but this is probably needed to keep the weight to a minimum. The wire is quite flexible, covered with a braided surface and 2.5 meters long, which makes it sufficient for most users. Unless you have placed your PC very far from your keyboard, you should be fine. The sliders for adjusting size are made of steel and can extend the height of the headset by up to 30mm on each side. 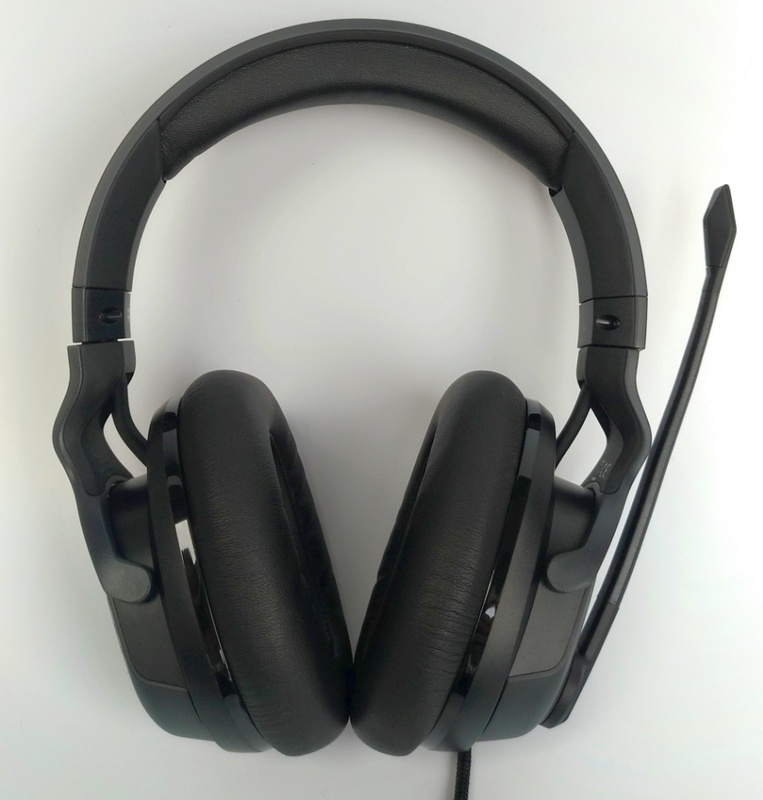 Adjustments are made in small click-intervals, but unlike many other headsets, no numbering is available to ensure similar adjustment on both sides. This is a minor detail, as I had no problems with the adjustment during my test period. I weighed the ROCCAT Khan AIMO and got 292 grams (without the cord), which fits well with the 300g it says on the box. 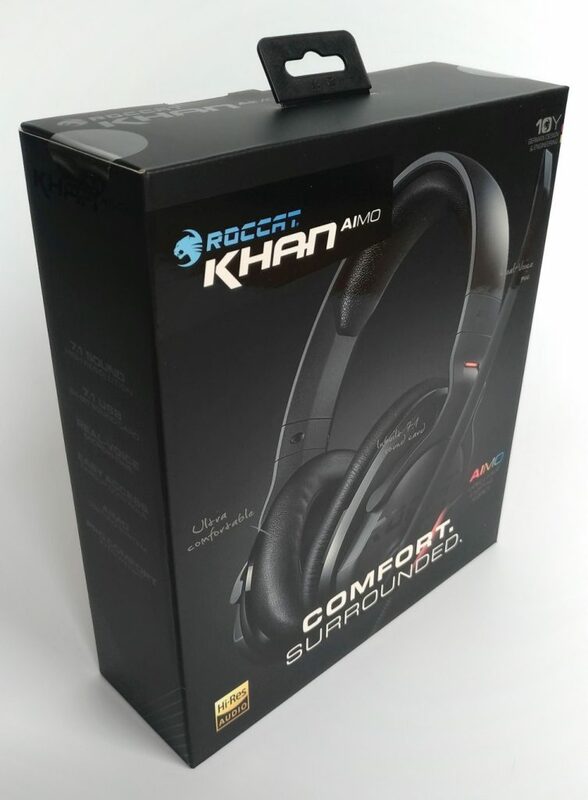 Ear cushions feels like standard foam and cover material, although ROCCAT suggests on the box that they have used memory foam. The padding inside the top of the headset is very different, and here the memory foam capabilities are very apparent and quite nice. All in all the headset is one of the more comfortable i have tried, as it is well padded, light-weight, and has a minimized contact surface. Almost all surfaces of the ROCCAT Khan AIMO are hard plastic with a slightly grained finish. I prefer this over the rubber-like surface seen on some earlier ROCCAT headsets, as it both looks better and is easier to clean. In order to allow some flexibility for the microphone, it is made of a different plastic than the rest of the ROCCAT Khan AIMO. Initially I was very disappointed not to see a mute-indicator LED on the mic, but later realized that ROCCAT made it obsolete with a new useful auto-mute feature (which is detailed in the Features section). 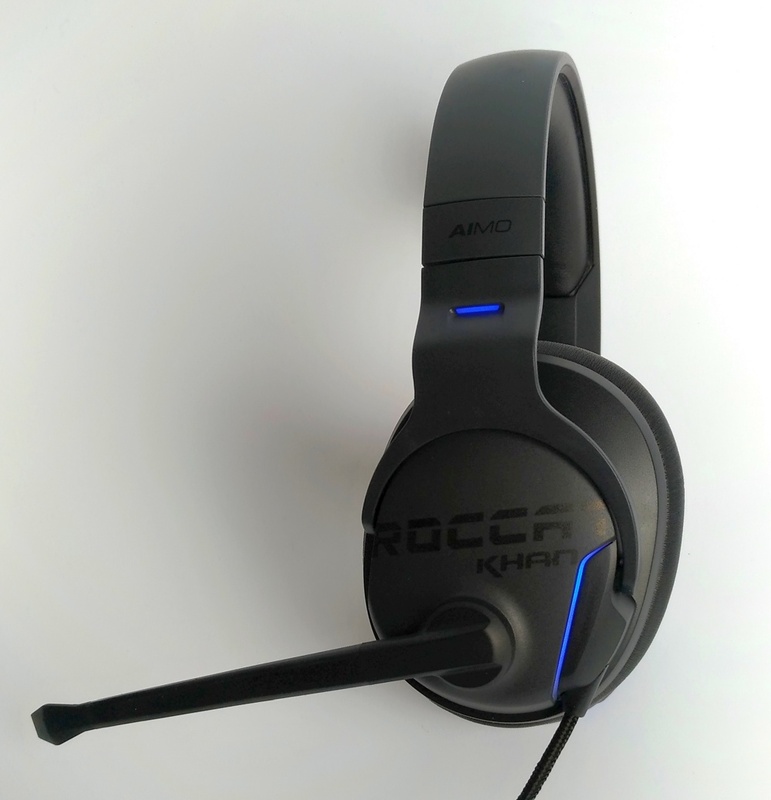 Whereas the ROCCAT Khan AIMO headset will work as soon as you plug in the USB, you will need to download the official drivers to benefit from all the nice features. Until then, you just get a basic stereo headset. 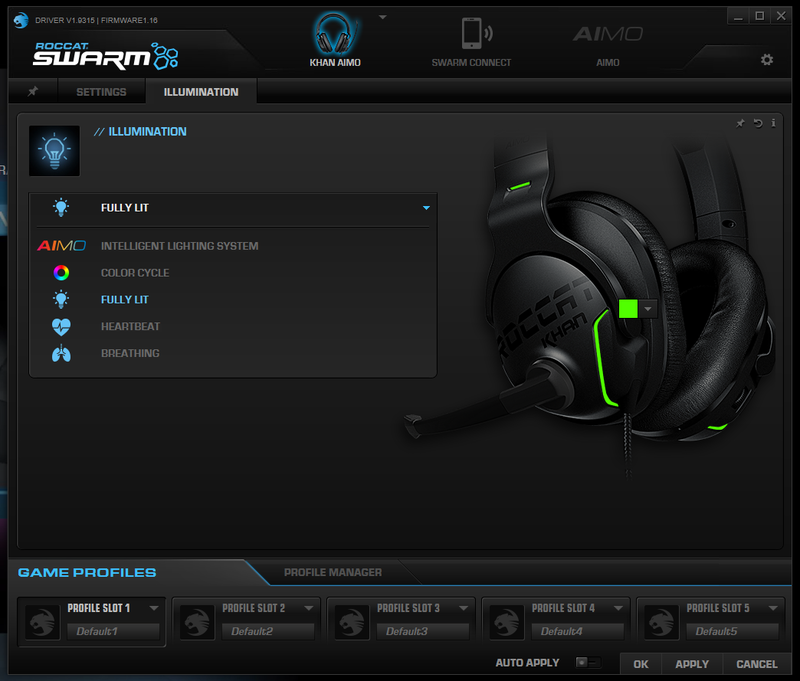 To install the ROCCAT Khan AIMO drivers, you need to download the ROCCAT SWARM software. This platform collects settings, drivers and firmware updates of your (newer) ROCCAT products, and works quite well. You can get the latest version of SWARM on the ROCCAT website here. 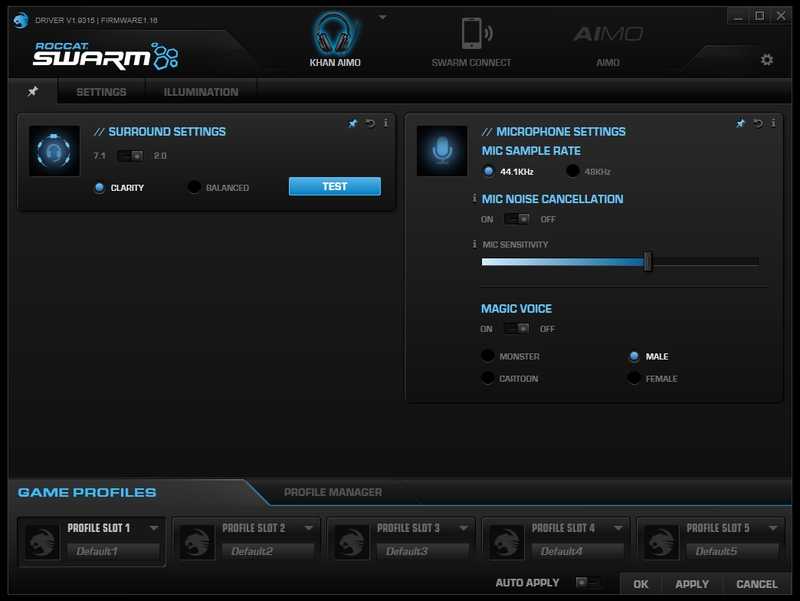 After installing SWARM, you plug in the Khan AIMO headset in a USB port, and are prompted to download and install the appropriate drivers from inside the SWARM program. This works quite well, and is a nice upgrade from earlier ROCCAT products. Below are the three configuration screens of the driver software. You can pin preferred settings to the first screen based on your preferences. Switching from 7.1 surround to 2.0 stereo will result in a huge sound style difference. Similarly, choosing between “Clarity” and “Balanced” will radically change the shape of the sound. This allows you to find a setting that you prefer. Personally I prefer 2.0 stereo + Balanced for listening to music and movies, while 7.1 + Clarity is great for gaming and pinpointing directional sounds. 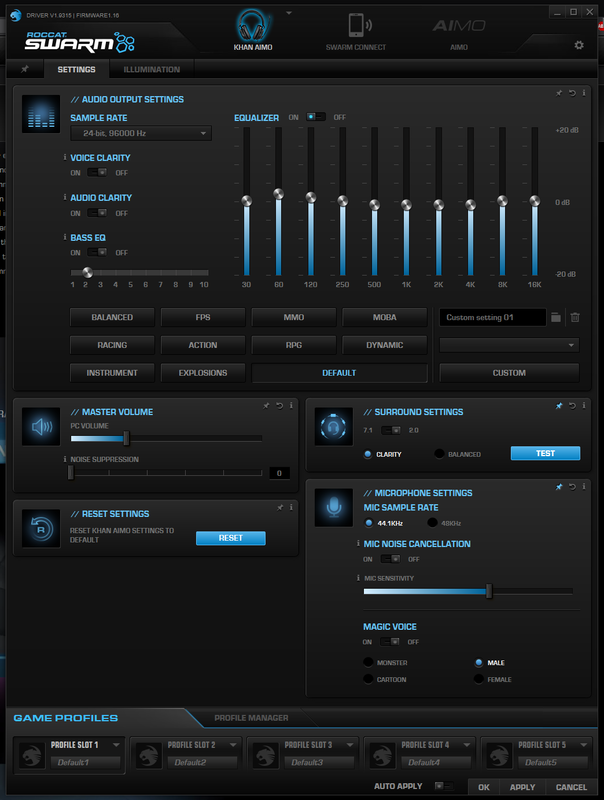 I doubt that most people will dive into tweaking the equalizer settings for simple day-to-day use, but it is definitely a big plus that the ROCCAT Khan AIMO comes with the option. This makes it possible to finely adjust the sound spectrum to match your personal preference. Finally, the illumination options allows choosing between 16 million colors and multiple modes. If you have other ROCCAT peripherals with AIMO support you can have the software choose and sync a light show fitting your current state of desperation or excitement while in-game. 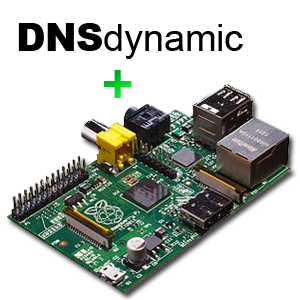 It is also possible to just set a fixed color, or turn of the lights completely. 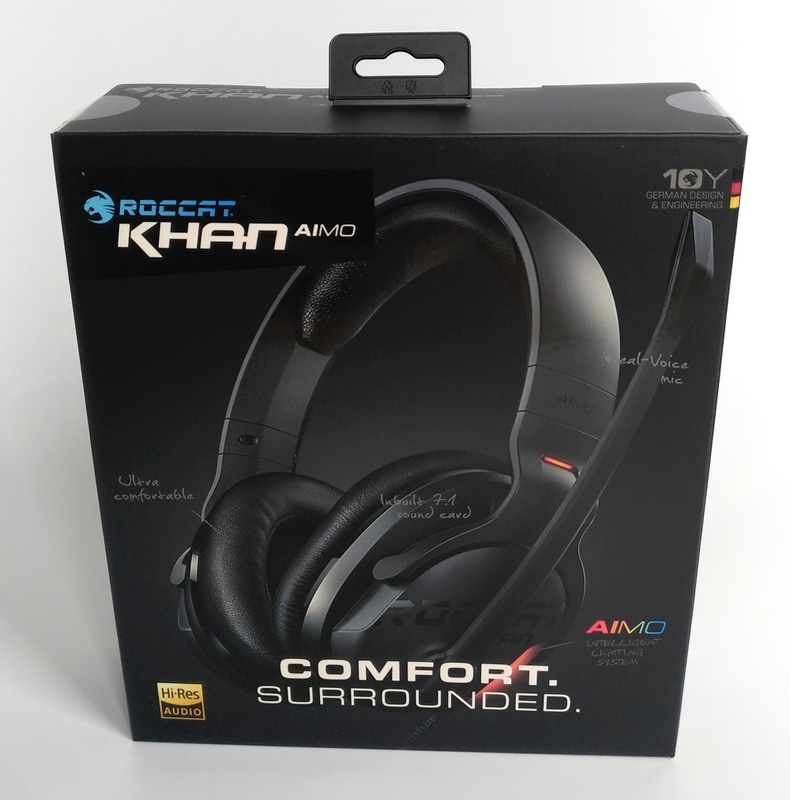 When it comes to sound, the ROCCAT Khan AIMO delivers a crisp and clear output, while doing a reasonable job of keeping out unwanted external noise. Even though the headset has passive and not active noise cancelling, it keeps out a fair amount of ambient noise. The sound provided by the 7.1 surround setup in the over-ear cups is full and well balanced, with a lot of freedom to adjust the tones to match your personal preference. If you are used to listening to music in 2.0 stereo, the same tracks will sound quite different on the 7.1 setting. After a while, I found that I got used to the difference, and now prefer the 7.1 setting which gives the sound much more depth. For gaming purposes, the ROCCAT Khan AIMO delivers a good advantage in clear distinguishable directional sound, as long as you remember to use the 7.1 setting. This is especially great for FPS games, when you want to estimate enemy positions based on the noise they make. Team communication is a big focus for the ROCCAT Khan AIMO, and even though voices of your friends comes through nice and clear on standard settings, there is an additional “Voice clarity” feature if you want to prioritize communication even further. This does come at the cost of less full and rich game sounds, but can be useful for online meetings. The microphone delivers clear and noise free audio, especially compared to analogue 3.5mm jack plug headsets where microphone noise is a frequent pain. Your teammates will be able to hear the difference. Although the ROCCAT Khan AIMO doesn’t come with a lot of buttons and knobs, it does hide a few pleasant surprises. A single button on the right earcup allows toggling of 7.1 surround or 2.0 stereo. If you use the headset for both games, music and movies, this is a feature that comes in quite handy. Whereas games are obviously played with 7.1 surround, movies or music with only 2.0 stereo sound may sound a bit thin on the 7.1 setting. This button allows an easy switch, so you don’t have to choose one over the other for good. A small knob, also on the side of the right earcup, allows adjusting the sound level. 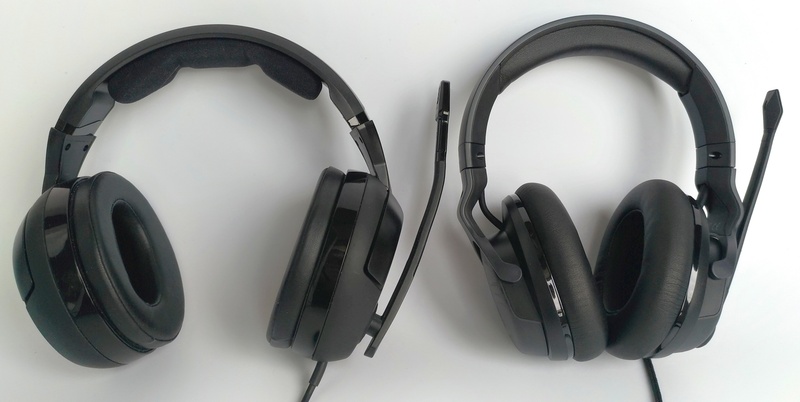 Unlike older headsets, this is not an additional layer of level adjustment, but is interfaced directly with the driver. Turning the knob will increase or reduce the windows sound volume in steps of 2 on the windows 0-100 sound scale. This feature works quite well as a fast way to adjust sound volume mid-game. Finally, my favorite feature on the ROCCAT Khan AIMO is the auto-mute of the microphone. At first, I did not understand the lack of a mute LED, but soon found that it is simply obsolete on this headset. Inside the rotating mechanism of the microphone is a mechanical switch that will mute the microphone when in upright vertical position. As the switch has a nice tactile feedback while turning the microphone past it, you won’t be in doubt when it switches on/off. Although this disables the microphone in the headset, it does not change whether the microphone appears as muted or unmuted in the windows settings. As long as you keep this in mind, auto-mute is a nice little feature. 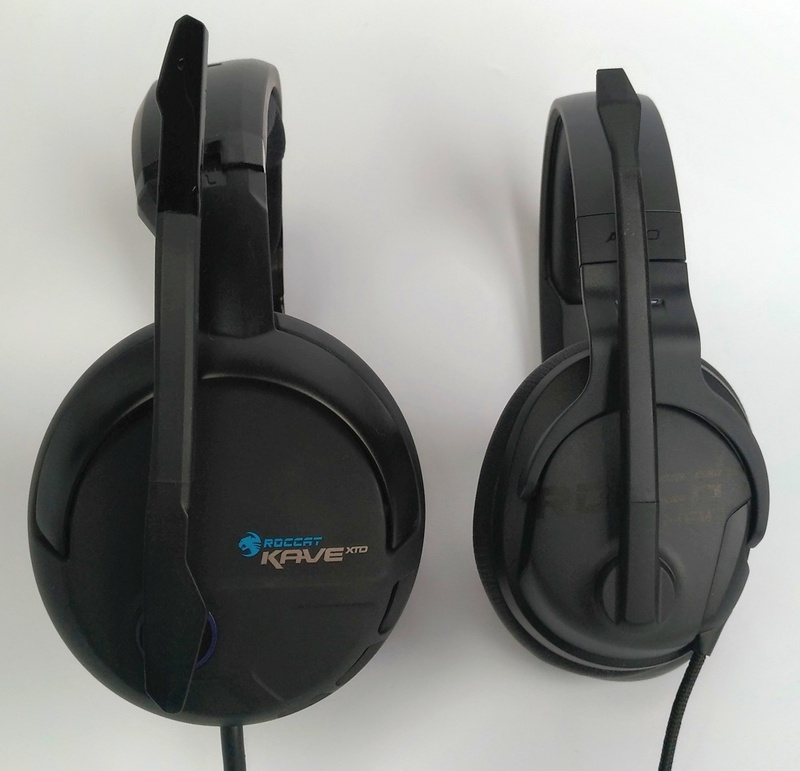 For several years I have been very happy with my Kave XTD headset, and since many might face a similar choice of whether to upgrade or not, here is a small comparison. When it comes to size, the ROCCAT Khan AIMO is a lot smaller than the Kave. In my opinion this is a plus for the Khan AIMO, as they managed to squeeze even better sound in a smaller package. I have been very happy with my Kave, but now it looks a bit bulky compared to the Khan AIMO. Weight-wise the Khan AIMO wins again, with its 292 grams vs. 362 for the Kave XTD. The Kave has a detachable microphone, which the new Khan AIMO does not. In theory, this makes the Kave easier to bring for listening to music e.g. while traveling. However, as the Kave is big and has a large control unit in the middle of its long cord, in addition to 4 jack plugs, I have never used it anywhere else but my desk. Also, remembering that the Khan AIMO has no jack-plugs, just a single USB-plug, it is highly unlikely that it will be used while traveling, which reduces the need for a removable microphone. When it comes to sound quality, my opinion is that the ROCCAT Khan AIMO sounds better. This may be simply because of the advancement in technology over the past years, or because of the 7.1 surround of the Khan vs. just 5.1 for the Kave. Regarding comfortability, I don’t see a clear winner between the two at this moment. I expect that this could change in a few weeks, when i have used the Khan AIMO for a while and the memory foam cushions starts getting used to the shape of my head. Maybe this is also because it takes some time to get used to a different fit. I definitely like that the Khan AIMO has less surface contact around my ear than the Kave. After trying the ROCCAT Khan AIMO, i believe that the time has come to retire my old Kave XTD. The Khan AIMO is both lighter, sturdier more advanced and delivers superior sound quality regardless of your current sound card. 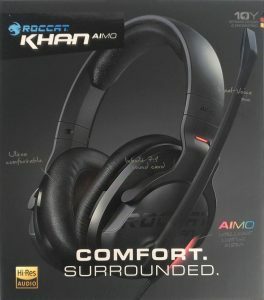 The ROCCAT Khan AIMO does however come at a higher price than average gaming headsets, so you have to be willing to pay a small premium to get the 7.1 high-res audio. 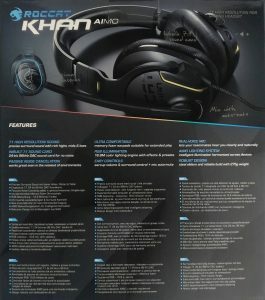 Compared to other similarly priced gaming headsets, I like that the Khan AIMO comes without too many unnecessary “features”. I want my headset to be simple, functional and good looking, not a disco ball of light or shaped and colored like a sports car. The Khan AIMO does what it is supposed to, and does it well. Nothing more, nothing less. You can find more information about the ROCCAT Khan AIMO here on the official website. By Mikkel at February 18, 2018 .